I made a lot of progress over the weekend and finally pulled out the squares from FOTY 2016. Mom was sitting around chatting while I was sewing, so I asked her to sort them for me. She had never done that before, so it was a challenge. She didn’t realize how much of a challenge it was to put fabric squares together with ‘like’ colors. She is more used to painting and that is a whole different experience. She also uses a color theory system called the Munsell system. Now I have stacks of squares in semi-color order with which to start. I wasn’t going to gradate them again, but they are too large to add in black or charcoal squares a la Ellsworth Kelly. I don’t want to make another giant quilt. I don’t think it is next on my list, but it is coming up. 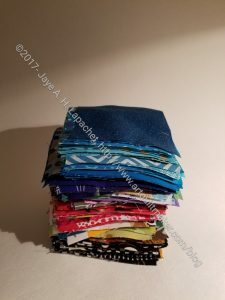 Two-sided quilt? Can the colors be “evenly” divided into 2 categories? Warm/Cool …. Prints/Solids … Gifted/Kept … Projects/Quilts … etc ? FOTY?? Ooohhh! Interesting idea! I just wrote a post about a MQG webinar and your idea fits right in.